I don't think I can say things any better than Kim did. She hit the nail on the head, precisely. 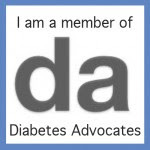 For me, what gets me down about diabetes is the mental and emotional side of things. As a person living with diabetes and mental health issues, life gets pretty rough sometimes. Diabetes + disordered eating + anxiety + depression = one hot mess Jess. Sometimes it's hard to tell where diabetes ends and my mental health issues begin. They are all so completely intertwined. That's not to say that every day is awful. Because that's not true. I have good days and bad days. And the bad days seem to come in clumps. I'll have stretches of bad days. To be honest, I've been in the middle of a difficult stretch for the past few weeks. There's been a lot going on in my personal life. A myriad of smaller stressors that have left me feeling completely overwhelmed. Stress can trigger my binge eating. Which triggers my anxiety. Which can trigger my depression. All of which can do a number on my blood sugars. It's all inexorably linked, like a spiderweb. I may be a hot mess, but I've come a long way. This Mental Health Month, here's what I want you to know: you are not alone, and don't be afraid to seek help. Seeking treatment from a mental health professional was the best decision I could have made. Yes, I still have bad patches, but I've come so far. And things are so much better overall. I am better equipped to handle and process my feelings. The difficult patches don't last as long as they once did. Like my grandma always said, this too shall pass. And depression lies. And, there's absolutely nothing wrong with wishing it would pass more quickly. Hugs! Completely - it's all a huge spiderweb, and that damn spider sometimes comes after us. OK, now I've freaked myself out and can't finish commenting without looking over my shoulder for stalking spiders... Hey, totally agreed. Thanks for writing this, Jess.